Becky Guggisberg’s enthusiasm for community, art and life has always been infectious. 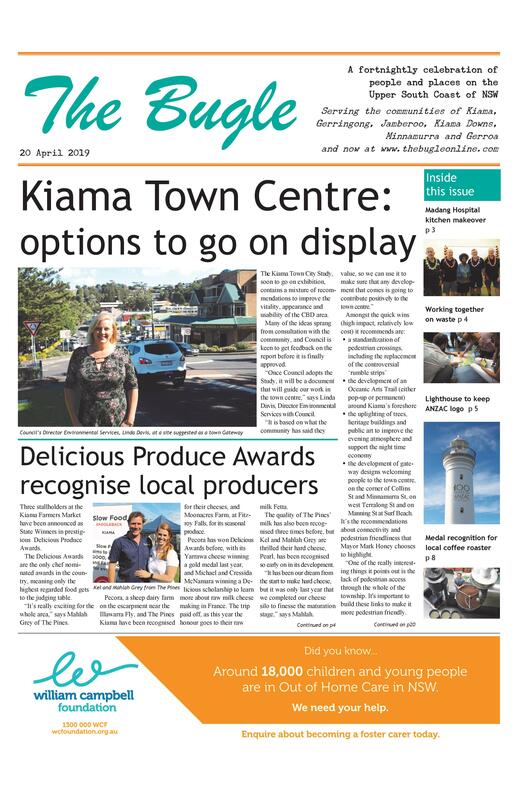 Now President of the Kiama Jazz & Blues Club, she is bringing her energy to the job of making sure as many people as possible get involved with this year’s Festival, held on 9-11 March. Under her leadership, and with a new musical director, Dan Sullivan, this year’s Festival is looking to make people sit up and take notice. Then get involved. “This is our town’s celebration and everyone is welcome and encouraged to be part of it,” she says. “No tickets, no fences, just pure creative fun. “You can choose your own adventure – from intimate moments with accomplished musicians to whole venues dancing together; from park time picnic play with the family to very adult events in the evening. “Although you may not know too many of the bands yet – you’ll soon be fans. “Music is so healthy for us all, and the shared experience makes it even better. While sticking to the tried and true formula of presenting the music at numerous venues around town, with no cover charge, the Festival has expanded to offer 90 performances at 40 venues, including clubs, pubs, cafes, restaurants, and even a church. “This year marks a new turn in the Festival’s growing reputation, with the re-introduction of international artists to the lineup,” says Dan Sullivan. Deak Harp adding the Kiama poster to his collection of memories. 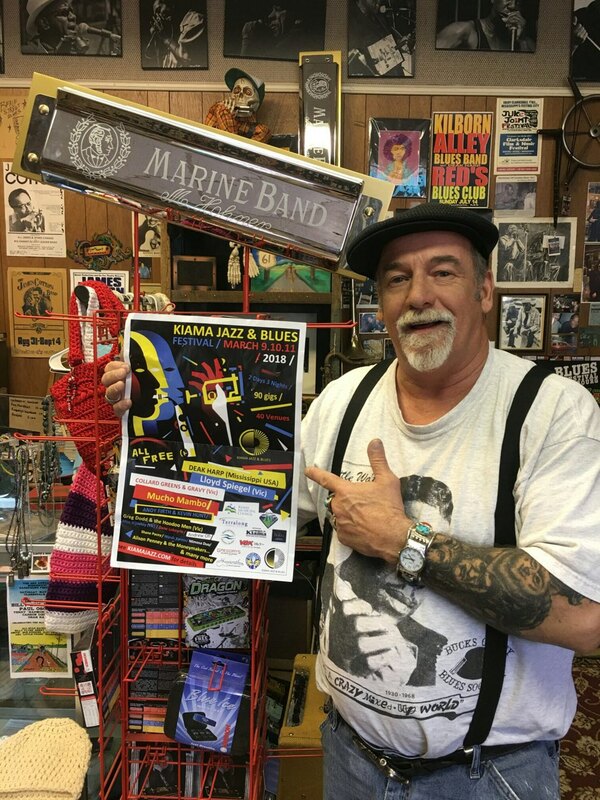 The hard working musician will be playing at the Leagues Club on Friday night, conducting a workshop for harmonica enthusiasts on Saturday morning (the only paid event of the Festival), playing at the Kiama Bowlo on Saturday night, and closing the concert in Hindmarsh Park on Sunday. 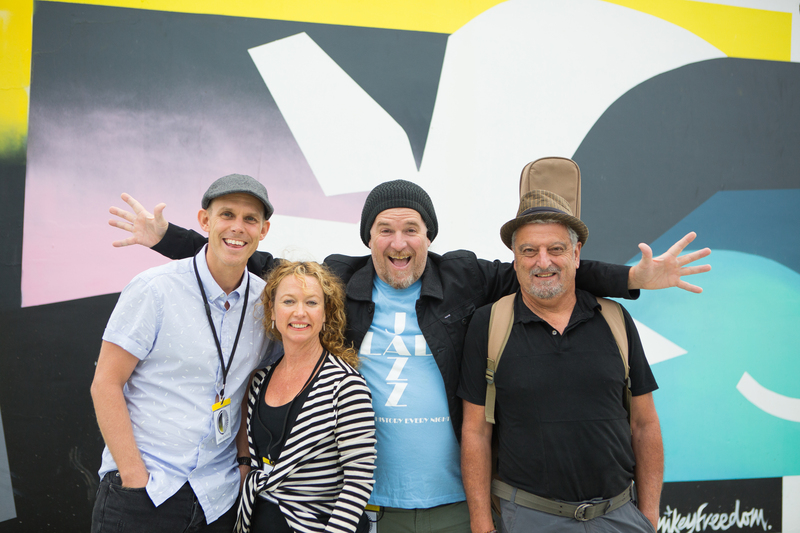 Joining him on the program are a great range of Australian talent including acoustic bluesman Lloyd Spiegel, gypsy jazz duo Mimosa Duo, blues legends Wards Xpress and orchestral virtuosos Andy Firth and Kevin Hunt. Becky is also championing a greater emphasis on art. “As a full-time artist, it’s definitely close to my heart,” she says. “Something I remember from the early days of the Festival was admiring the poster art for each year. during the Festival, was commissioned to create the posters and programs.